Dave and Alison are living the dream. They need to work to support their lifestyle but because they’re the clever techie types, they can work from the comfort of their boat for just a day a week and enjoy their lifestyle as true continuous cruisers for the rest of the week. What a life! Allison (51) Dave (47) and the dog Charlie (7). Charlie is a rescue dog and slightly bonkers. We like to think that we are less bonkers but people who know us may disagree. Dave and I have been together since 1997. He’s clearly quite mad as he took on me and my three daughters 17 years ago when they were just 4, 8 and 10. He is the best step father ever and has the patience of several saints having gone through ridiculous quantities of PMT. My Dad and my Uncle both have narrow boats and I’d been on boating holidays in my younger days. After Dave and I married we did a few hire boat holidays with friends and really enjoyed them. My Uncle took his boat to France and cruised around there for several years and then some friends of ours decided to buy a boat and live on it up at Sawley. After a few more boating holidays and chatting with friends and relatives with boats we started thinking about possibilities for the future. We had very stressful careers and we decided that a change of pace would be a good idea after Dave was diagnosed with Crohns disease. It wasn’t possible short term as we had the three girls and my Mum who lived near us had terminal cancer and needed our help. We decided it was a viable long term plan and in 2007 we bought a boat suitable as a future live aboard. We spent the next 5 years driving from Kent where we lived to the boat, near Daventry, almost every weekend and holiday. We loved it and after my Mum died in 2011 and the girls were all gone or planning on leaving home we decided to move onto the boat full time in June 2012. Our house in Kent is now rented out which pays the mortgage and gives us a little bit of extra money. 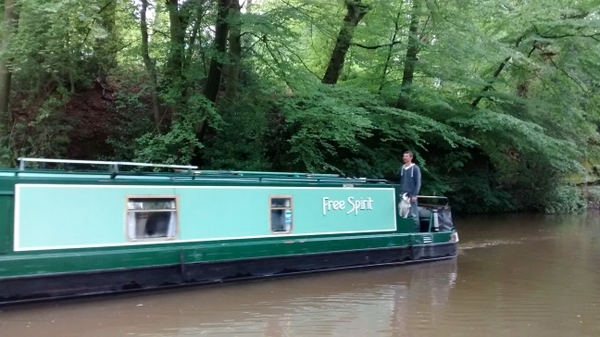 We couldn’t afford a new boat so we bought one that was 10 years old and came with the name ‘Free Spirit’. We loved the name when we got the boat but the regular shouts from the towpath of ‘I’ll have a whiskey’ and our standard reply of ‘we only have gin’ is wearing thin. We had a permanent mooring at Weltonfield when we got the boat until we left in June 2012. We thought we would return to Weltonfield each winter but it hasn’t proved practical. We now moor up in whatever marina we can find if we need to go away for any reason and find a marina for Winter wherever we decide we need to be October/November. I’d love to have a permanent residential mooring with a postal address and a bit of land but they are difficult to find and the CRT ones we have seen have been very expensive. Eventually I think we will sell the house in Kent and see if we can afford a house with a canal mooring in the midlands. A 55ft Liverpool Boats Cruiser – we almost bought a 62 ft semi trad but we decided that was just a bit too long and it needed a lot of work considering it was £10,000 more. All of our time other than when we’re visiting friends and family. This year I think we will have left the boat in a marina and gone away for about 8 weeks in total. We were and still are IT Solutions Architects. We design IT systems for a very large Insurance company. We were extremely lucky that when we resigned in 2012 they were so desperate not to lose us (yes we both worked at the same place doing the same job) that they were happy for us to work part time from the boat. We work 1 day each a week and that keeps us in relative luxury. Not having an address is tricky. We have relatives in Kent that manage our post for us and we are still registered with doctors in Kent. We keep our post to an absolute minimum but there are some that still require a postal address. Winter can be difficult but that’s mostly down to a lack of going anywhere and the constant mud. I volunteered for Age UK last winter and did two days a week all winter. It was great fun and really worthwhile. Moving on to new places nearly every day and being able to explore the UK from a new perspective. Our lives are much simpler, less stressful and we have less stuff. Stuff is over rated and despite being our only home our boat is very uncluttered. We have got storage well and truly sorted. Living on the boat has also made it easier to be places we need to be even if it takes a bit longer to get there. My Dad is now ill so we were able to spend last winter in a marina on the Macclesfield to be near him. The boat is perfect as it is for the two of us but when we have visitors a little more seating space would be helpful. It would be great if the boat were just a bit longer, maybe 60 FT, and there was room for a diner between the kitchen and saloon. Dave would like a semi trad stern but Charlie is not convinced. We walk to the nearest shop or occasionally get a supermarket to deliver to us if we can find a suitable location. It means we live on chicken a lot of the time (Roast Chicken, Garlic Chicken and Thai Green curry are our favourites). We usually manage to get to a decent sized shop or town at least once a month to stock up. In winter we do a lot of casseroles on the stove as its so easy to do and it saves on gas. We have a washing machine on board and washing usually dries quite quickly hung about the boat with the windows open. Traveller drop through pump out which is fine. They can get a bit smelly on flushing if its nearly pump out time but some extra blue usually sorts that out. Last winter we got a cassette toilet and used the Elsan point to save moving to the pump out station every two weeks. Luckily the cassette toilet slotted in nicely next to the pump out toilet and Dave didn’t seem to mind emptying it every 3/4 days. We have a 3 wireless modem which gives us 15 GB of data a month. It’s essential for our work and having travelled quite a lot on the UK river and canal system we can say that there are very few places we don’t get a signal. Our office gave us a Vodaphone dongle – it was useless. We rarely had a signal so we gave it back to them. 15 GB used to be loads of data for a month but we are noticing that as apps and gadgets become more data intensive we are starting to get very close to our 15GB limit each month. No watching catch up TV on the internet these days. We loved the Llangollen but we also loved the Kennet and Avon from Bradford-on-Avon to Bath. 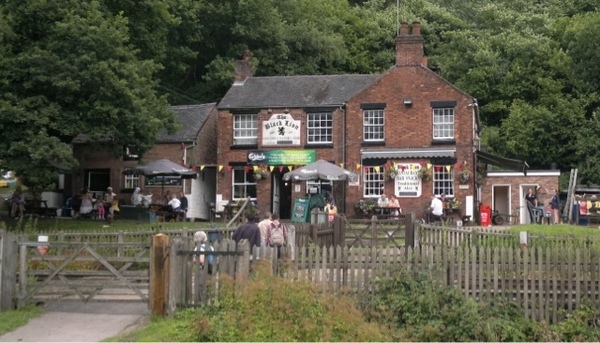 When we did the Thames from Oxford to Reading last year we decided rivers were our thing but I think our absolute favourite so far is the Caldon Canal down to Froghall – especially the bit around Consall Forge where the steam train runs alongside. The engine generates a fair bit of electricity and we move for around 3 hours most days but we also have 2 x 100W solar panels that are amazing. We had the batteries replaced last winter with 3 x 140 amp batteries and that made a huge difference to how long we can keep ourselves in electric without running the engine. We use quite a lot of electricity with all of the gadgets but we don’t have a freezer (except the little compartment in the 12v fridge), microwave or some of the other electricity guzzling appliances we see on other boats. We also only use high power appliances like the washing machine while the engine is running. I have learned to live without hair dryers and straighteners unless its a very special occasion. Very warm. If we are moving we have a heat exchanger that runs the central heating. We also have an Eberspacher that will run the central heating but we rarely use that. If we’re stationary we have a Morso squirrel stove that we can keep going continuously on 2 bags of coal a week. Don’t under estimate the costs. Boats are expensive to maintain and there always seems to be something that needs doing. Since we bought the boat its been blacked 4 times, had a repaint, new stove, numerous engine repairs and eventually a new engine. On average we spend around £2000 a year just keeping the boat in good condition. Buying food in local shops can be expensive and diesel and pump out costs add up. I reckon we end up spending around £400 a month on food, pump out and diesel. Having said that its cheaper than living in a house and much more fun. We could spend less by moving less. 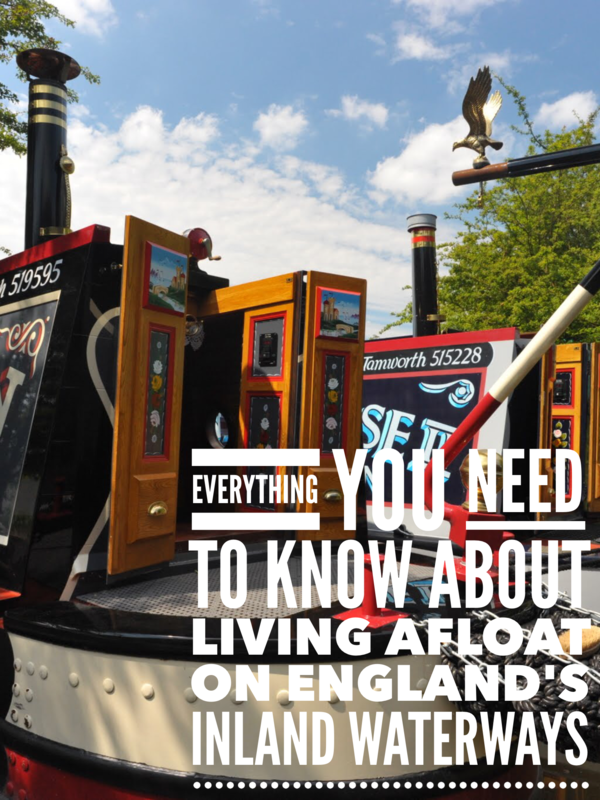 We knew that moving onto a boat from a house involved getting rid of a lot of accumulated possessions. We had to clear a 4 bedroom house and move into a 55ft narrowboat. This took us around 2 months of going to charity shops, the tip and selling anything we could. We kept some really important sentimental stuff (again relatives with spare cupboard space) but the majority of what we owned had to go. We got rid of all of our CD’s, records and books and most photos went in favour of kindles, ipods and hard drives. Once we’d managed it we found it was incredibly freeing but it was really really hard to do. The local hospice and British Heart Foundation made a fortune from our donations and we don’t miss any of it. Beware if you are not used to spending lots of time with your other half. We already worked and lived together before we moved onto the boat but we still found that we were spending even more time together on the boat. We make sure that we have our own space (we have a settee and TV each end of the boat for football/rugby/Grand Prix days) and we see other people as often as we can. Some times we get to large cities and realise that we have forgotten how to operate in normal society. Its easy to accidentally become a bit of a recluse if your a natural introvert and spend all your time with someone you know really well. Family reaction. Our families have been very supportive and help us out with the ongoing issue of needing a postal address and storage of the few things we couldn’t let go of. Our three daughters had grown up and left home (27. 25 and 21) and thought it was a great idea. I do worry that they don’t have a family home to return to if things go wrong but so far so good. They have their Dad and he has a beautiful home if they need a place to stay. We’ve had a family crisis or two in the last few years but we have the money to rent places to stay and hire cars if necessary. We’re very lucky and we know it but I do sometimes feel guilty that we aren’t around to help out more with Dave’s parents who are getting on. At some point I think we will end up back in Kent helping out.Its a shame that there is nowhere near them to moor the boat. Maybe we can low load the boat to their back garden. What’s the link back to your blog/web site? Dave writes a blog. Its not like most boat blogs as Dave has a very well developed sense of humour and loves music. You’ll see what I mean if you read a few entries. Its a great way of making sure family and friends can keep up with what we are up to and Dave seems to like doing it. Love your blog! I’m sure I saw and admired your boat somewhere on my epic voyage from Aldermaston to Alvechurch in August.